Today's Book Blogger Appreciation Week theme is Community, and we're encouraged to highlight bloggers who have made book blogging a unique experience for us. I'm sliding in under the wire here around 11 pm PST, but here goes...! 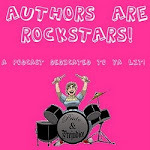 Michelle from Never Gonna Grow Up Reviews - you probably know that Michelle and I co-host the Authors are ROCKSTARS! podcast together, but what you may not know is that we've known each other since we were MERE TEENS. And we lived halfway across the country from each other and I never thought we'd meet in a million years. And now we're, like, mature adults (or something) and we have husbands and houses and kids and we're practically neighbors! How awesome is that? Michelle inspired me to start blogging. Her blog is such a pleasure to read-- updated consistently with thoughtful and honest reviews. Beth from A Foodie Bibliophile in Wanderlust - In addition to being an amazing blogger, Beth is a middle school teacher, and her dedication and enthusiasm for education are so inspiring. I hope every student has a chance to learn with a teacher like Beth. She and I met via online wedding planning message boards almost ten years ago, and I'm so glad we're still in touch. Lalitha from SoCal Library Connection - Not technically a book blogger, but library bloggers are in the same vein, right? You don't even know how awesome this gal is, but if you meet her at a library conference- because she's always there, participating and contributing- you'll quickly find out. We worked as library assistants together, we went through library school at the same time, we had our kids within months of each other both times around... it is is a privilege to call Lalitha a friend, and I'm so glad she's started blogging. Watch for her posts-- she's always doing something cool. Katie from Secrets & Sharing Soda - And now for something completely different: I don't actually know Katie. But I love her blog! Her reviews are always so insightful and well-written, and her "Old School Sunday" feature, in which she reviews middle grade fiction from the '80s and early '90s, brings a nostalgic smile to my face every time. Thanks for the memories, Katie! And I have to thank Danielle, aka the1stdaughter, from There's a Book... I've only recently "met" her via Book Blogger Appreciation Week, but I was truly humbled that she mentioned me in her post today, so I wanted to give a shout-out back! The quality of her blog is truly something to aspire to, and I can already tell she's just such a nice, outgoing person. 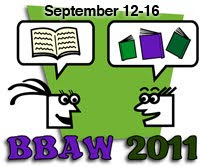 This is my first time participating in Book Blogger Appreciation Week, and I'm already liking it. What a fun opportunity to share the love! I am unfamiliar with most of the bloggers you highlighted so I am excited to have some new blogs to read! Wow, I think I'm new to ALL of these which is, in a waaaay, sort of great as I get to add more great bloggers. Loving these posts, today! Aw shucks!! *blushes* Thank you, Allison. YOU ROCK. Awesome tips about to create blog online. Nowadays many resources find out everyone through the source of internet so therefore many of the students get educate from college credit for work experience from the source of online higher universities .